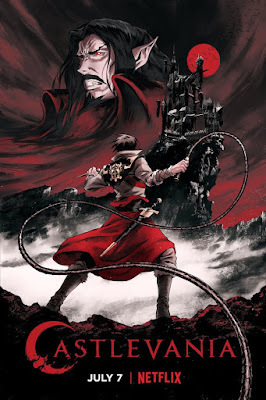 I was quite surprised to hear that Netflix was making an animated series based on Konami's hit video game Castlevania. I was even more surprised that it was being penned by none other than Warren Ellis, one of my all time favorite comic book writers. Video game adaptations are usually pretty terrible and don't capture the soul of what makes the game beloved by fans. Castlevania breaks this mold by keeping all the elements that make the game intriguing and even expounding on some of the story elements to explain the narrative better. The plot of the show is a loose adaptation of the third game of the series: Castlevania: Dracula's Curse which came out on NES in 1990. Dracula is attacking the countryside of Wallachia with his army of hell demons and only Trevor Belmont (voiced by Richard Armitage) can stop him. In the original game Dracula wasn't given much of a backstory (plots were quite thin back in those days) but in this new adaptation he is completely fleshed out and at times it's easy to empathize with his actions. There is a strong anti-church tone and the way the characters philosophize about it is much deeper than I was anticipating. Ellis does have the characters speaking using some modern colloquialisms, especially when it comes to swearing, and some people might not like the sardonic edge that the dialogue has at times. I dug it though, as I have always found Castlevania to be somewhat campy. Powerhouse Animation Studios provided the animation for this series and for the most part it looks excellent. The style looks like a mix between Peter Cheung (Aeon Flux) and Yoshiaki Kawajiri (Ninja Scroll) and would be at home in the '90s era of anime. During the action scenes it's smooth and dynamic, but it can look a little bit janky and off-model during the quieter scenes. They used a gothic color scheme that incorporates lots of dark reds, oranges and browns and it compliments the atmosphere perfectly. This is an extremely gory show with blood and guts flying everywhere and it doesn't pull any punches. Castlevania is one of the best horror-themed animations I have seen in a long time. If there is one glaring omission it's the music--there is not a single piece from any of the Castlevania games and this series is just as famous for its amazing music as it is for its game play. We couldn't even get Vampire Killer over the end credits or something?! Throw us nerds a bone, Netflix! Jokes aside, the music used isn't bad or anything, it's a serviceable electronic heavy score that doesn't detract from the show. The voice acting is great as well, with all the actors hamming it up for their characters. The first season was only four short episodes and it ends on a cliffhanger. Luckily,it has been renewed for another season with eight episodes so we can find out the rest of the story. Hopefully they keep up this level of quality as this is one of the best video game adaptations that has been produced.